Hey, you gotta give these comics a real chance. Oh. 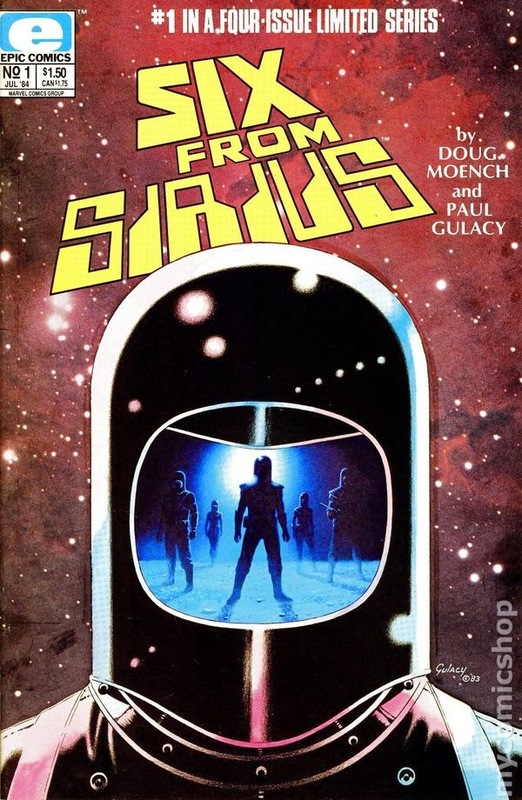 Six From Sirius #6 - Written by Doug Moench, illustrated by Paul Gulacy, lettered by Gaspar Saladino, edited by Archie Goodwin, published by Epic Illustrated. Back when my brother and I were wee-little kiddies, we would go on the big summer trip. Whether the trip was to Tahoe, Lake Almanor, Huntington Lake, or what have you, my mom always loaded us up with comics to read on the long drives in the hope that we would not murderize each other from lack of better things to do. For the most part, her idea worked. Now, as an adult, I still prefer to travel with a bunch of comics to read wherever I am. Although I could load up the iPad and the kindle, the nostalgia of being away from home and holding an actual comic in my hands is a feeling digital can never recreate. Digital also can’t recreate the awesome feeling of walking into a new comic book shop (Atlantis Fantasy World) and finding a few treasures in their $.50 bin, something like Six From Sirius, which I somehow missed back in ’84. Better late than never, especially on this awesome first issue. The “Six” are intergalactic problem solvers, each with a particular specialty that they bring to the team. Their current mission is to rescue a beautiful ambassador being held on a high-security prison satellite before negotiations between two planets on the brink of war degrade any further. With a meticulously planned scheme, the Six infiltrate the satellite, but when they finally find the ambassador, they are shocked to discover that she is perfectly fine staying right where she is. 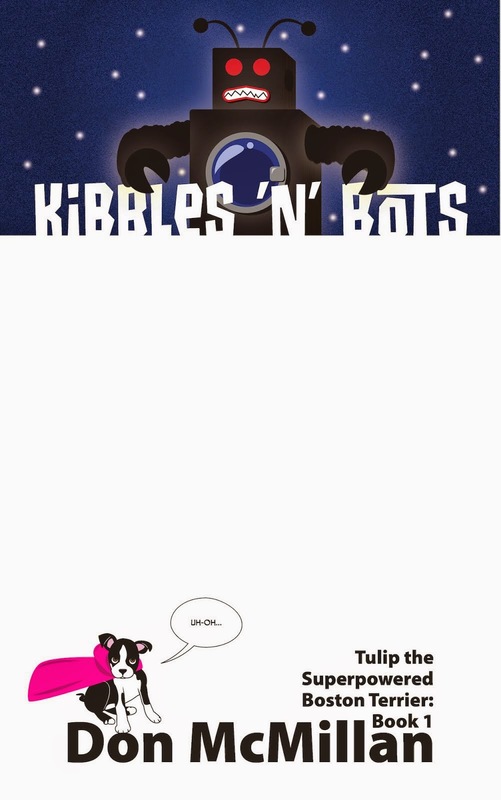 Spoiler alert—I love this timeless sci-fi comic. Each of the Six get their “moment” to shine and clue the reader into the nature of their character; this is also true of the ambassador. Yes, there are a lot of word balloons on each page — emphasis on “a lot” — but Moench’s writing pulled me in completely by the third page. From there it is half character development and the rest is breaking into the prison and a history lesson on the strife between two planets, and a moon inhabited by spiritualists who look to be caught in the middle. Gulacy’s art (design, coloring, storytelling, linework…everything) is completely stunning, and each character is distinct, realistically brought to life on the page. In searching around the net, I read somewhere that Gulacy used markers to color this issue, and given that the book is from ’84, the quality of this entire issue is beyond impressive, especially the gorgeous, atypical-for-the-time colors, which must have been nerve wracking in the finality of the technique; digital colorists have it easy with but a quick ctrl + z. My main problem with Six From Sirius is now that I have read the first issue, I desperately need to know what happens next. It’s kind of horrible, denizens, I combed through the bins for issues two through four, but to no avail. If I had read the issue in the store, I would have been incredibly more thorough in my desperate search for the remaining issues in this dynamic series. So, I hope to find a well-stocked comic shop in my travels, or to pick up the Dynamite reissue trade and the volume two four-issue follow up. If not, I will be ordering ALL of the issues in this must-read, timeless treasure. VERY HIGHLY RECOMMENDED! 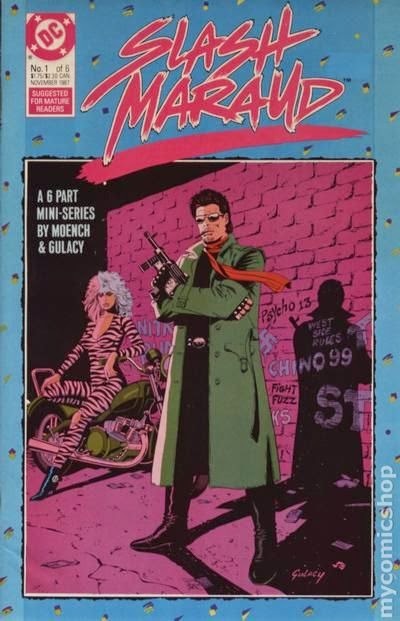 Slash Maraud #1–6 - Written by Doug Moench, illustrated by Paul Gulacy, colored by Adrienne Roy, lettered by John Costanza, published by DC Comics. How’s this for a coincidence? I pick up the amazing first issue of Six From Sirius at a store in Santa Cruz, read it, love it, and then four days later visit a comic shop in San Jose and come across a six-issue bundle ($4.00 no less!) of Slash Maraud, a mini by the exact same creators. First off, I don’t remember seeing this 1987 release at all back in the day. Not during the ’80s, and not until two and a half decades later in a bargain bin of a store I had never visited before did this gem find its way into my loving mitts. Crazy, huh? 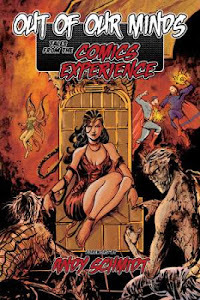 What’s not crazy is this series is a heck of a blast to read, but after just checking out Moench and Gulacy’s other awesome book, the fact that this post-apocalyptic, sci-fi thriller is a great read from start to finish is no far stretch. Back before the arrival of the “Shapers,” brown fuzzy alien invaders bent on “shaping” the Earth to fit their own homeworld, humanity was not doing so hot. Human’s were the same ol’, disappointing, parasitic vermin who kill their own kind along with their own planet. What’s even more disappointing is the fact that when the Shapers arrived to take the planet as their own, meaning the eventual extinction of the human race, humanity did not band together to thwart their enslavers, they at best allowed them to take over, and at worst embraced their new masters. Slash Maraud couldn’t stomach the weakness of his species and vanished from the public eye…until now. Slash is back and on the hunt for his old main squeeze, Wild Blue, and to confirm the rumor that a Shaper has turned traitor and holds the key to stopping Earth’s transformation of death. But in order to begin to set things right, Slash is going to need more than a traitor and Blue…he’s going to need an army. Dude! Radical! Okay, if you grew up in the ’80s, then you remember the onslaught of post-apocalyptic movies that were around, both good and bad. The mullets flowed, the shoulder pads jutted, the surly attitudes of our stalwart heroes alone could blacken an eye, and this series embraces it all, but most importantly, it is well-written and paced, and beautifully illustrated — although it has the more traditional style of coloring, which is cool, too. Each issue is action-packed and touches on some aspect of popular ’80s cinema through the use of sci-fi, horror, action, exploitation, train heists, nazi scumbags, and the ultimate alien threat. This series is a total kick in the pants, and greatly reminds me of a Tarrantino film, before there were Tarrantino films. I enjoyed this mini tremendously, and implore you denizens to dive into your nearest bargain bins to seek out this freakin’ fun comic. HIGHLY RECOMMENDED! 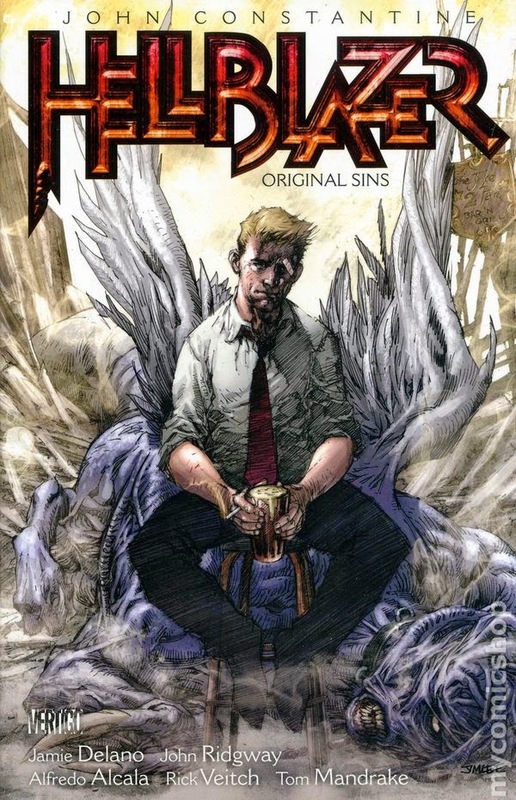 Hellblazer: Original Sins TPB Volume 1 - Written by Jamie Delano and Rick Veitch; illustrated by John Ridgeway, Bret Ewins, Jim McCarthy, Rick Veitch and Tom Mandrake; inked by Alfredo Alcala; colored by Lovern Kindzierski and Tatjana Wood; lettered by Annie Halfacree, Todd Klein and John Costanza; published by Vertigo Comics, a DC Comics imprint. Since we are talking almost exclusively about the ’80s today…remember how I mentioned above that since a very young age I have always traveled with a stack of comics? Well, before I even left the house on this trip, I acquired the first three bulky trades of Hellblazer with the resolution to read all three before I set foot back in my home. It shouldn’t be a problem. Hellblazer is one of those books I bought as the issues were being released up until about issue 12, where I regrettably dropped off the series. I suppose I could do a “Young Donist” “Current Donist” look at the first few issues of this trade, but since I didn’t stick around all that long, let me just say that although I did like the series back in the day, I appreciate it far more in 2014. I was first introduced to John Constantine in the pages of my desert island favorite Saga of the Swamp Thing by Alan Moore, and loved the mysterious character the second his Sting-esque form walked onto the page. From there, I stumbled into the series, and enjoyed his appearance in The Sandman as well. Sadly, living and money eventually meant I had to sacrifice something, and Hellblazer was one of the casualties of the time; thank goodness, I have a lot of catching up to do. 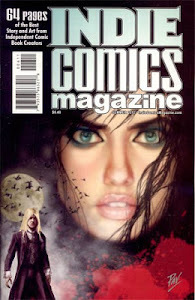 “Original Sins” contains issues one through nine, as well as Swamp Thing numbers 76 and 77, so it is kind of a burly book, but at least it is not all that heavy as it is printed on the lighter — and arguably better — paper from the time. I have thus far only read issues one through four of this chilling horror series that is soon to become a television show called Constantine, which I will definitely be checking out come fall. If you like scary subject matter centered around a protagonist who is kind of an a_hole, along with demons, and evil, and possession, and the struggles of heaven and hell, then this is completely the book for you. Yes, I have not yet finished this first volume, but I can whole-heartedly say you have nothing to fear by picking up this awesome series in this reasonably priced format. I know I will eventually be buying each volume of this series in relatively short order. HIGHLY RECOMMENDED! Keeping It Positive…Y'Know, Chillin’ - Yeah, keeping things happy this week, plus I actually have to hit the road here in short order in order to prevent Obie from tracking me down and guilting me into divulging the location of the petty cash box key. You, denizens, have the mission of acquiring great comics of the ’80s this month, primarily the Moench and Gulacy books I spoke about up top. If you can’t find any, then your secondary mission is to assimilate as many post-apocalyptic ’80s movies (good and bad) as you can possibly find. Peace be with you. Good luck.